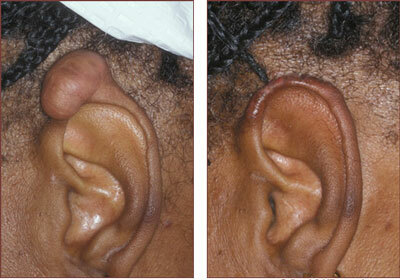 A keloid essentially refers to growth of excessive scar tissue at a site where the skin has healed after an injury. Skin injuries from acne, burns, chickenpox, and ear piercing, minor scratches, incisions from surgery or trauma or in vaccination sites could result in the formation of keloids. Keloids are more common in people aged between 10 and 20, and in certain races such as African Americans, Asians, and Hispanics. Keloids also tend to hereditary. A keloid might turn darker than the skin surrounding it if it is constantly exposed to sunlight during the first year after its formation. When outdoors, cover a keloid with a patch or Band-Aid or use sunscreen to avoid direct exposure to sunlight. Ensure to follow these steps for at least a period of 6 months following injury or surgery for an adult, or up to 18 months for a child. Imiquimod cream could be used to prevent the formation of keloids after surgery.